Barum Gig Club are making 2018 their “Off the Row’d” year in an effort to fund the creation of a Watersports Centre that Barnstaple can be proud of. By the kind permission of Tesco, the latest fund-raising project is a Rowathon at the store near Barnstaple railway station on Saturday 17th February from 10.00am to 10.00pm, and Sunday 18th February from 10.00am to 4.00pm. Proceeds from this event will be shared equally between Childrens Hospice South West and the Barum Club’s Off the Row’d appeal to fund a new Watersports Centre for Barnstaple. 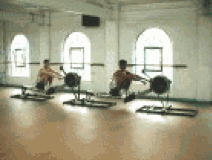 During the weekend club member Graeme Clarke will be attempting to row a Marathon distance (26.2 miles) in less than three hours, supported by other club members who will demonstrate continuous rowing on the Club’s Ergo Rowing machines. In addition the new Ergo Sliders financed by Community Fund grants provided by Councillors Brian Greenslade and Mair Manuel will be on show. The Sliders have been a boon to the Club, giving a much more realistic rowing experience, and the Junior rowers particularly have benefitted. A collection will be made on the day, and Club members will be on hand to talk about the Hospice and future club activities.